Few of us have ever experienced anything like the current job market. Millions of jobs have disappeared, and everyone from experienced executives to newly minted college graduates are facing the toughest environment in decades. Which is why top-notch interview skills are more important than ever. 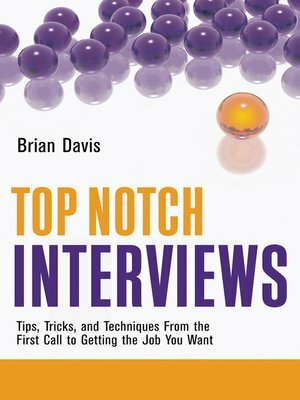 Top Notch Interviews teaches job seekers at any level, from all industries and professions, the author's proven technique to increase interview success. Even if you are the most qualified candidate, have the perfect resume, and possess the perfect background, you may still lose the job if you lack interviewing skills. Tips for confidently answering questions with an easy-to remember method. How to identify the phases of the interview and formulate your responses accordingly. How to avoid common pitfalls that eliminate the majority of candidates. How to navigate through the pursuit phase including thank-you notes, follow-up, negotiations, and acceptance. Dramatically boost your chances of winning your next interview and get the job you want using Top Notch Interviews.